A top US university will give extra support in its admissions process to descendants of slaves sold by the university in the 19th Century. 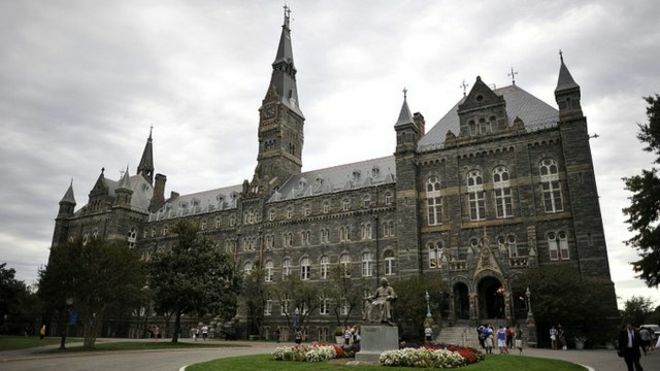 In 1838, Georgetown University sold 272 slaves owned by the Washington-based institution. The university set up a project to see how it could make restitution for this involvement in the slave trade. There are also calls to rename college buildings after former slaves and to fund a research institute on slavery. Georgetown, as other US universities, has been examining how it should respond to its own historical involvement in slavery. In particular, there have been questions about the sale of a large group of men, women and children, in 1838, with the funds used to clear the university’s debt. This was a well-documented sale and genealogists have been able to track down a number of the descendants of the slaves, who were sold to work in plantations in Louisiana. The university set up a “working group on slavery, memory, and reconciliation”, which has now made recommendations on how to acknowledge and make recompense these events. It proposes an official apology, creating a public memorial and naming one of its buildings, Isaac Hall, in recognition of an Isaac whose name is the first mentioned in the sale of slaves. But the working group also calls for the descendants of the slaves to be given an advantage in the admissions process for this highly-competitive university. The working group’s report also calls for a new institute at the university to study the legacy of slavery. Earlier this year, Harvard University put up a plaque in commemoration of slaves who had lived and worked at the university. The university also announced that it would abolish the use of “master” in academic titles, because of connotations of slavery. Harvard Law School announced that it would change its official seal after student protests that this included the coat of arms of a brutal 18th Century slave dealer.